A proposed rule would amend the Agency for International Development Acquisition Regulation to incorporate a revised definition of information technology and other requirements relating to information security and information technology approvals. The rule would provide increased oversight of contractor acquisition and use of information technology resources. The U.S. Agency for International Development proposed to amend its acquisition regulations regarding incentive awards for personal services contracts with individuals. This proposed rule would establish a separate monetary and non-monetary awards program to recognize and reward individual personal services contractors for their contributions to the accomplishment of USAID's mission, goals, and objectives. The Boeing Co., Huntsville, Alabama, was awarded $4,141,315,338 (contract modification), partially definitizing the $6,560,000,000 undefinitized contract action issued January 31, 2018, on contract, Ground-based Midcourse Defense Development and Sustainment Contract. The Missile Defense Agency, Huntsville, Alabama, is the contracting activity. The Boeing Co., St. Louis, Missouri, was awarded a ceiling priced $4,040,458,297 modification to convert a previously awarded advanced acquisition contract to a fixed-price-incentive-firm-target multi-year contract. This modification provides for the full-rate production and delivery of 78 F/A-18 aircraft, specifically 61 F/A-18E and 17 F/A-18F aircraft for fiscal years 2018 through 2021. The Naval Air Systems Command, Patuxent River, Maryland, is the contracting activity. General Dynamics Electric Boat, Groton, Connecticut, was awarded a $2,039,763,908 modification to a previously awarded contract for additional material (to include Long Lead Time Material and Economic Ordering Quantity) associated with the Fiscal 2019 – Fiscal 2023 Virginia class submarines (SSNs 802 – 811). The Naval Sea Systems Command, Washington, District of Columbia, is the contracting activity. Huntington Ingalls Industries, Pascagoula, Mississippi, was awarded a $1,471,290,677 fixed-price-incentive modification to a previously awarded contract for the procurement of the detail design and construction of Landing Platform Dock 30. The Naval Sea Systems Command, Washington, District of Columbia, is the contracting activity. Lockheed Martin Missiles and Fire Control, Grand Prairie, Texas, was awarded a $1,135,410,156 modification to a Foreign Military Sales (Poland, Bahrain and Romania) contract Guided Multiple Launch Rocket systems full rate production. U.S. Army Contracting Command, Redstone Arsenal, Alabama, is the contracting activity. Six contractors are sharing a maximum $985,000,000 firm-fixed-price, indefinite-delivery/indefinite-quantity contract under solicitation SPE8EH-16-R-0001 for fire and emergency services equipment. The contracting activity is the Defense Logistics Agency Troop Support in Philadelphia, Pennsylvania. To access full text documents on CheetahTM you must subscribe to Government Contracts Reports. From Wolters Kluwer Legal & Regulatory's Government Contracts editors, here are summaries of the important recent developments in this practice area. 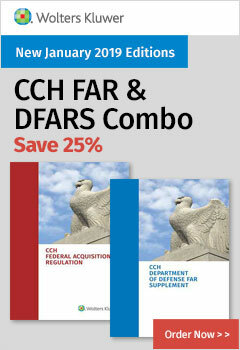 Complete coverage of these issues, and more, appears in Government Contracts Reports, the Government Contracts Reporter, and related CCH products. Complimentary Whitepaper! 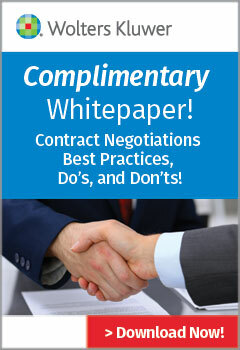 Contract Negotiations Best Practices, Do’s, and Don’ts! Copyright 2019 CCH Incorporated and its affiliates. All rights reserved.